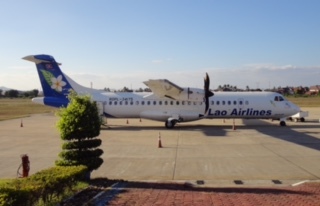 Our 2015 visit to Laos is coming to an end and we will soon board a plane soon to begin the long journey home. We've enjoyed the last couple of days visiting various artisans in and around Vientiane. We were amazed at the skill and expertise of the carvers, painters and furniture builders. Last night, we celebrated the sunset from a lovely vantage point on the Mekong River. Goodbye Laos. We look forward to the next School for Kids in Laos project! The big day is here and 7:30 am found us on the bus headed to Ban Viengkham. For the first time, we were accompanied by a large number of donors from all over the world - Britain, USA, Singapore, Laos and 4 provinces in Canada! We entertained each other on the long bus ride with songs sung in Mandarin, Lao and English! The school children were lined up ready to greet us and offer bouquets of flowers. Major donors were honoured with plaques which were placed in the school. The Yap family presented the students with 340 textbooks, school supplies and sports equipment - a very generous donation on top of their financial support. The District Department of Education representative and school officials expressed their appreciation and made a commitment to maintain the school in future years. Guests enjoyed the authentic Lao luncheon and dancing which followed the inauguration ceremony. Later that evening, the Yap family hosted a dinner for SKL representatives. In a short time, we have forged a strong relationship with these delightful and generous people. During the dinner, the family presented us with their very significant donation for the next school. We are most grateful and are encouraged as we start to plan for the next School for Kids in Laos project! We had an early departure by bus from Savannakhet to Ban Chantai. SKL reps sat down with senior officials to finalize and sign the agreement. The very generous Singapore group provided and prepared a nourishing lunch for the students. In addition, they handed out school supplies and sports equipment which brought smiles to many faces! The mood was celebratory and we reluctantly boarded our bus and headed to Savannakhet airport to catch our flight back to Vientiane. Packed our overnight bags and flew to Savannakhet to meet up with Ken and our group of Singapore supporters. SKL committee members met with Ban Chantai elders and representatives to hammer out the details of a potential agreement to build a new school in their village. Monday morning found us exploring the intriguing Wat Si Saket with its thousands of tiny Buddha images in the niches of the cloister walls and hundreds of seated Buddhas from the 16th and 19th centuries. Tonight, the night market! Today, we headed to the morning market as everyone wanted to buy something new to wear to the school opening on the 18th. Then off to Buddha Park and Pha Tat Luang, the most sacred monument in the country. The beautiful gold-covered Stupa shimmered in the hot afternoon sunshine. What a welcoming committee to greet us when we arrived at Wattay Airport in Vientiane,Laos - a fine mix of members of the Winnipeg SKL committee and dear friends in Laos! I was so looking forward to authentic Lao food for dinner and we were not disappointed. Nice to have Jackie Markstrom, another SKL supporter along on this trip. We had a very productive morning. We bought notebooks, pens, scissors. Then we went to a sport equipment store to buy volleyballs, vineballs, nets, soccer's nets and badminton kits. All will be distributed December the 18th. Another generous donation from the Yap family from Singapore. We got the day off to an early start with a 9:00am visit to the Education Printing Enterprise (EPE) to see if it would be possible to purchase the textbooks that Ban Viengkham Secondary was lacking. The helpful EPE staff not only quickly filled the order within our budget, but also offered us a van ride back to our hotel to deliver the 340 textbooks covering ten different courses including mathematics, history, geography and science that will be presented at the inauguration. We are grateful for the generosity of the Yap family from Singapore which made it possible to meet this top priority need. We were very pleased to accomplish this task before Ken's flight to Luang Prabang to meet our special guests from Singapore. We spent the rest of the day making a detailed inventory of the package from Richard Van Der Sande and preparing our blog posts. We enjoyed a delicious lunch of pungaboun today in Vientiane. It was fun experimenting with different combinations of fresh herbs, raw veggies, rice noodles, spring rolls and pork balls all bundled up in lettuce leaf wraps. Yummm! After breakfast, we were lucky to get a ride out to Ban Viengkham from Prof. Viengphoukhanh and Prof. Deuane where we had a two hour meeting with school staff and the chair of the parent-teachers association to discuss plans for the inauguration ceremony on December 18th. We also updated the school enrollment and village population statistics. The Ban Viengkham Lower Secondary School serves six nearby villages. We asked the staff for input regarding what items would most benefit the students educational needs if donors would be able to cover the cost. Next we had our first opportunity to see the completed five classroom school building, water pump and washrooms and performed the final inspection before opening the facility in just a few days. After the two hour drive back to Vientiane,we did some quick shopping at the night market and had supper at Lao Kitchen near our hotel. In the meantime, a package arrived at the hotel all the way from Beijing thanks to Richard Van Der Sande. We were delighted to unpack it and find an ample quantity of school supplies for the students and teachers at Ban Viengkham which SKL will present on his behalf on Inauguration Day. Important meeting this morning with the school staff in Viengkham to discuss the inauguration on December 18th. This was our first opportunity to see the fifth school. Bravo! Photos of the preparations and more coming soon. After a very early breakfast at the Macchiato Coffee house, we drove out into the countryside to visit prospective villages for the next school construction project. The scouting process involves assessing the suitability of the location and community to meet our criteria including discussion with school and village representatives. Fortunately we had brought some sandwiches along for the drive, as it was a tight schedule given about five hours of driving were required. Fortunately, we found a potential village on our journey and still made it back to Savannakhet in time to catch our return flight to Vientiane. By coincidence at the airport, we crossed paths with a schoolmate of Ken's, Thaviseuth Phouthavong, one of the founders of SKL who now lives in the UK. We were lucky to have just enough time for a brief chat before our return to Vientiane via an unavoidable twenty minute stop in Pakse. Upon arrival in Vientiane we checked into the Douang Deuane Hotel close to the night market and enjoyed a late Chinese dinner at the Orchid Guest House nearby. We were surprised to come across a slice of UK style hospitality in Savannakhet when searching for a breakfast spot to fuel up before heading out to scout potential villages for our next school project. A refreshment break during a village visit was spiced up by Boualay, who accompanied us, with local treats such as fresh tamarind, a sweet yet tangy tropical fruit that is actually the bean-like seed pod from a tree. Welcome to the SKL 2015 trip to Laos. We hope you enjoy flying with us for the next few weeks. Without losing any time, Ken and I met François at the International terminal at Vientiane airport and walked a couple of hundred meters to the domestic terminal to board a domestic flight to Savannakhet to start our search for the next SKL school site. Upon our evening arrival, we were met at the airport by Boualay and Toui who had left the day before to drive over 6 hours from Vientiane. Next we checked into the Avalon Residence, a fairly new family run hotel that incorporates an historic house built in the 1960's with a more recent multi-storey structure. Over dinner in an open-air restaurant floating on the bank of the Mekong River and later back at the common room at the Avalon, we discussed plans for the coming days late into the night. We were fortunate to have breakfast with Phouvong Pamiseth, one of our generous supporters from Vientiane. We wanted to explore some ideas about possible future collaborations to benefit SKL. Our team is busy with final preparations for the inauguration of the new school in Ban Viengkham tomorrow. Our Singapore donors have provided textbooks, school supplies and sports equipment for the students at Viengkham so our bus will be fully loaded tomorrow when we leave at 7 am to make the trip to open SKL's fifth school in Laos!